Buzzsaw CD Ripper™ is an industry-leading, full-featured CD ripper for Windows. 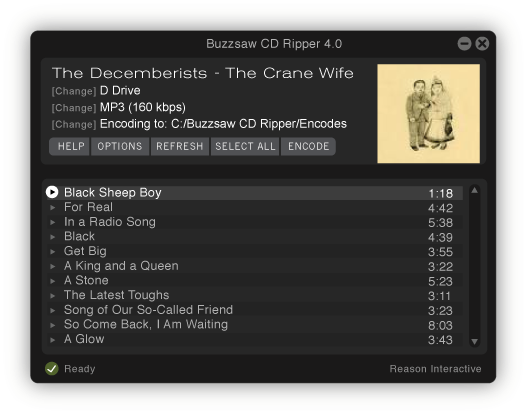 With Buzzsaw you can quickly and easily digitize your entire music CD collection. You can take your music with you: on your iPod or other digital music player - or play the music on your computer. Buzzsaw is also great for making backups of your CD collection. Buy now for only $30.00. Make CD-quality encodes at bit rates up to 320kbps. Choose from 32kbps to 320 kbps; MP3, Ogg Vorbis, APE, WMA and WAV audio formats. Encode CDs effortlessly and in minutes. Faster than most commercial CD rippers. One click encoding. You can customize options to your liking, then encode CDs with just one click. Make clean, organized MP3s with all the artist and album info automatically written to ID3 tags. Build an organized digital music library. Buzzsaw will create folders for each artist and album. Use the auto-encode feature to quickly rip your entire CD library. "Fast, easy, best ripper I've used so far. Ripping my audio library has just gotten easier. I've had to manually input album, artist, and song info manually... but with Buzzsaw, no need to...it does it for you... try the 15 free encodes and you'll be satisfied, I was!" Buzzsaw is incredibly easy to use, with a very logical approach. Just open it, toss in a CD, set your options, and hit "Encode". In a short period of time I was able to rip my entire CD collection to MP3's with no loss of sound quality. My music is now neatly organized, every track labled, with little effort on my part... I highly recommend this product." "If only all software were this good. Quality package!!! If you're looking for a tool to get your music from CD to mp3 from 32 to 320 kbps this is the tool to use. The free online database included even my oldest and most obscure CDs. The tool is simple, well laid out, and feature rich."